Condition: Pretty good for age, with overall low pile & minor losses at ends. 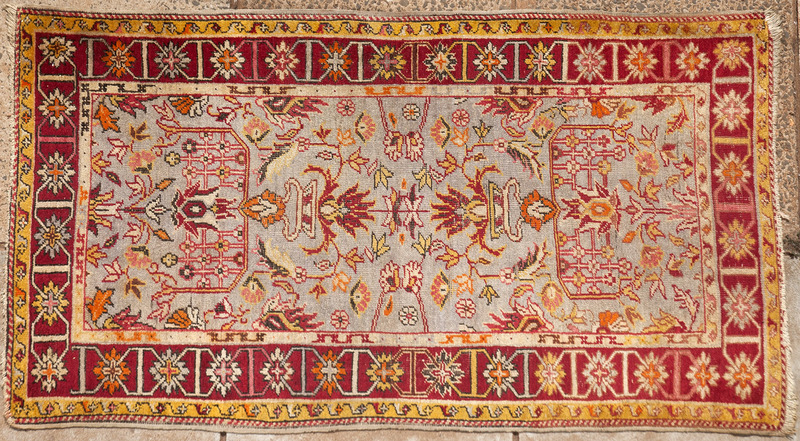 Notes: Only Anatolian rugs use this particular shade of yellow (well, with the exception of some old Rabat Morrocans that emulated), which brings a great sense of fun and 'joie de vivre' to the scene. The pale eggshell-blue field brings a sence of calm decorum to procedings, which could otherwise have become overwhelmed by the intense oranges and yellows. A charming and highly individualistic piece of woven art.